Whether you’re refinishing furniture or creating your own inlay, your dealer in wood veneers should have a wide selection to offer. More choice frees you to build and complete your project to a higher degree of originality. In the end, the product is something more you, providing greater satisfaction. It all begins with choice and with purpose. If your plan is to cover an item that’s made of particle board or delicate wood, then looks may be an important but secondary consideration. Or, if you’re working on an elaborate inlay, then your artist’s eye comes first. For inlays, your starting point is with two different shades or colors of wood. A more ambitious inlay may take you further. Your project may involve edge banding too, and for that decorative addition there’s a substantial difference between adequate and ideal. When wood veneers are chosen for their aesthetic appeal, it’s absolutely in your best interest to select the vendor who has a superior product cut with the highest degree of accuracy. That’s where we come in. Whatever you’re looking into wood veneers for, we at Sauers & Company Veneers can help. Your order can be large or small. 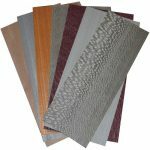 We’re a family owned company in North Carolina that ships wood veneer hobby packs, edge banding, decorative inlays, and veneer sheets to anywhere in the U.S. and worldwide quickly with more than 125 species in 6 different backing options for you to choose from.